In our database, there are 11 different nursing schools in Arkansas that either have RN to BSN programs that are either accredited by the Commission on Collegiate Nursing Education or the Accreditation Commission for Education in Nursing. Arkansas is a state the represents the hard working nature of the country as a whole. Residents within this state flock to the most profitable careers available. Of the most popular field to work in, the medical field is the most sought after for individuals within this state. The medical field contains some of the most profitable working positions in the country. There are 11 nursing schools in Arkansas with CCNE or ACEN accredited RN to BSN / BSN programs. Arkansas universities average enrollment is 14,334 students (much larger than the national average). There are 5 total cities in Arkansas with nursing schools offering CCNE or ACEN-accredited Bachelor's in Nursing degrees. No single city has an exponential number of options, but Little Rock does have 2 different university options. A further education does more than just provide more knowledge, but it also provides better experience that will contribute to better community and patient health. The very focus of nursing is the care of people in general. With a higher education, nurses can ensure that each patient is getting the very best care for their money. A higher degree in nursing contributes to a better life with a better financial future. A college degree is something that is irreplaceable, even with years of experience. There is no substitute for a great degree. Being the most qualified nurse will ensure that professionals are never at a lack of opportunity. This can be achieved by enrolling in one of Arkansas’ excellent RN to BSN programs. Nurses that take the next step to a profitable career will be met with open arms by employers throughout the diverse medical field. The Arkansas State Board of Nursing was established by the Arkansas Legislature over 100+ years ago, in 1913, to protect the life and health of its citizens by holding all nurses and nursing care professionals to a high standard, as well as regulate and approve nursing schools in the state of Arkansas. The ASBN has strict regulations for Registered Nurses, including the requirement to be an Arkansas resident with at least 5 years of experience as a registered nurse in nursing practice, administration, or teaching. 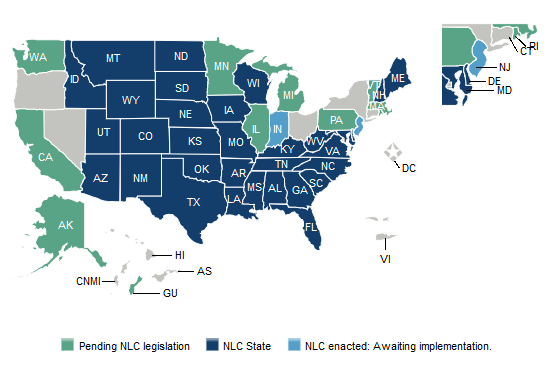 The Nurse Licensure Compact (NLC) allows nurses to have one license for nursing that gives them the ability to practice in the state where they current live as well as other states that are part of the compact agreement. Currently there are 25 states that are a part of the NLC agreement. Arkansas is a part of the NLC agreement. Below is how Arkansas compares to the national average for Registered Nurse employment. We took the national averages and compared it to the outlook for Arkansas. All data comes from the BLS and ONET Online. Below you will find a complete list of all of the RN to BSN programs in Arkansas that are accredited by either the CCNE or the ACEN. Right now we are including only programs that are accredited by either the CCNE or the ACEN. We do plan on adding other programs that may have regional or national accreditation later, but it is our intent to review every program that goes up on our website prior to posting. Our database only contains BSN programs, and it is hand edited and maintained by actual people. Be sure to contact us if we are missing a CCNE or ACEN accredited program.